Larry May. Global justice and due process. Cambridge University Press, 2011. 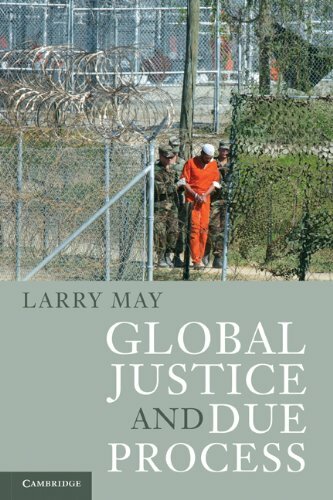 In this book the author makes a case for the extension of due process of law to international law. Focusing on the procedural rights deriving from Magna Carta, such as the rights of habeas corpus and nonrefoulement, he examines the legal rights of detainees, whether at Guantanamo or in refugee camps. He offers a conceptual and normative account of due process within a general system of global justice, and argues that due process should be recognized as jus cogens, as universally binding in international law. Kevin W. Saunders. 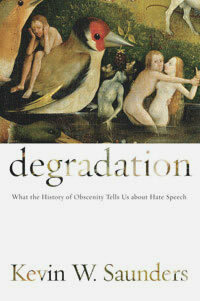 Degradation : what the history of obscenity tells us about hate speech. New York University Press, c2011. The book studies the relationship between obscenity and hate speech. The author traces the legal trajectory of degradation as it moved from sexual depiction to hateful speech. Looking closely at hate speech in several arenas, including racist, homophobic, and sexist speech in the workplace, classroom, and other real-life scenarios, he posits that if hate speech is today’s conceptual equivalent of obscenity, then the body of law that dictated obscenity might shed some much-needed light on what may or may not qualify as punishable hate speech. Transnational administrative rule-making : performance, legal effects, and legitimacy / edited by Olaf Dilling, Martin Herberg, Gerd Winter. Hart, 2011. David Skeel. The new financial deal : understanding the Dodd-Frank Act and its (unintended) consequences. Wiley, c2011. Lawrence Goldstone. Inherently unequal : the betrayal of equal rights by the Supreme Court, 1865-1903. 1st U.S. ed. Walker & Company, c2011. Bob Ybarra. My demons were real : constitutional lawyer Joseph Calamia's journey. Arte Publico Press, c2010. Katherine Pang. Constructing a criminal case : an integrative approach to criminal law. Carolina Academic Press, c2011. Benjamin W. Cramer. Freedom of environmental information. LFB Scholarly Pub. LLC, 2011. Evangeline Abriel, Sally Kinoshita. The VAWA manual. 5th ed. Immigrant Legal Resource Center, c2008. Marc R. Generazio. Immigration law : a guide to laws and regulations. American Bar Association, c2011. Immigrant children. The Future of Children, 2011. Sally Kinoshita, Susan Bowyer, Catherine Ward-Seitz. The U visa : obtaining status for immigrant victims of crime. 2nd ed. Immigrant Legal Resource Center, c2010. Lee Burgunder. Legal aspects of managing technology. 5th ed. South-Western Cengage Learning, c2011. Laurence R. Helfer, Graeme W. Austin. Human rights and intellectual property : mapping the global interface. Cambridge University Press, 2011. Alejandro Chehtman. The philosophical foundations of extraterritorial punishment. Oxford University Press, 2010. Criminalising cartels : critical studies of an international regulatory movement / edited by Caron Beaton-Wells, Ariel Ezrachi. Hart, 2011. Niaz A. Shah. Islamic law and the law of armed conflict : the conflict in Pakistan. Routledge, 2011. Linda Mulcahy. Legal architecture : justice, due process and the place of law. Routledge, 2011. Robert E. Rodes, Jr. Schools of jurisprudence. Carolina Academic Press, c2011. Regulation versus litigation : perspectives from economics and law / edited by Daniel Kessler. University of Chicago Press, 2011. Leah M. Christensen. Learning outside the box : a handbook for law students who learn differently. Carolina Academic Press, 2011. Richard L. Hermann. The lawyer's guide to job security : how to keep your job, and make the most of it in good times and bad. Kaplan Pub., c2010. Methodologies of legal research : what kind of method for what kind of discipline? / edited by Mark van Hoecke. Hart, 2011. Richard Stim. Profit from your idea : how to make smart licensing deals. 7th ed. Nolo, c2011. Joseph E. Root. Rules of patent drafting : guidelines from Federal Circuit Case Law. Oxford University Press, c2011. Alan R. Palmiter. Securities regulation : examples and explanations. Wolters Kluwer Law & Business, c2011. General explanation of tax legislation enacted in the 111th Congress : blue book. CCH, 2011. New markets tax credit handbook. Novogradnac & Co., 2011. Novogradac & Company. Introduction to new markets tax credits. Novogradac & Co., c2010. Chris Scott Graham. The way of the lawyer : strategies and tactics for negotiations, presentations, and litigation. First Chair Press, c2010. The woman advocate / edited by Abbe F. Fletman, Evelyn R. Storch. 2nd ed. American Bar Association, Section of Litigation, c2010. Examining the filibuster : hearings before the Committee on Rules and Administration, United States Senate, One Hundred Eleventh Congress, second session, April 22, 2010, May 19, 2010, June 23, 2010, July 28, 2010, and September 22 and 29, 2010. Climate change finance : providing assistance for vulnerable countries : hearing before the Subcommittee on Asia, the Pacific, and the Global Environment of the Committee on Foreign Affairs, House of Representatives, One Hundred Eleventh Congress, second session, July 27, 2010. Commercial real estate : a Chicago perspective on current market challenges and possible responses : field hearing before the Subcommittee on Oversight and Investigations of the Committee on Financial Services, U.S. House of Representatives, One Hundred Eleventh Congress, second session, May 17, 2010. Collateral consequences of criminal convictions : barriers to reentry for the formerly incarcerated : hearing before the Subcommittee on Crime, Terrorism, and Homeland Security of the Committee on the Judiciary, House of Representatives, One Hundred Eleventh Congress, second session, June 9, 2010. Accountability for foreign contractors : Lieutenant Colonel Dominic Rocky Baragona Justice for American Heroes Harmed By Contractors Act : hearing before the Ad Hoc Subcommittee on Contracting Oversight of the Committee on Homeland Security and Governmental Affairs, United States Senate, One Hundred Eleventh Congress, first session, November 18, 2009. Oversight challenges in the Medicare prescription drug program : hearing before the Federal Financial Management, Government Information, Federal Services, and International Security Subcommittee of the Committee on Homeland Security and Governmental Affairs, United States Senate of the One Hundred Eleventh Congress, second session, March 3, 2010. Alternatives to the current federal estate tax system : hearing before the Committee on Finance, United States Senate, One Hundred Tenth Congress, second session, March 12, 2008. Oversight on the Compact of Free Association with the Republic of the Marshall Islands (RMI) : medical treatment of the Marshallese people, U.S. nuclear tests, Nuclear Claims Tribunal, forced resettlement, use of Kwajalein Atoll for missile programs, and land use development : hearing before the Subcommittee on Asia, the Pacific and the Global Environment of the Committee on Foreign Affairs, House of Representatives, One Hundred Eleventh Congress, second session, May 20, 2010. Federal rulemaking and the regulatory process : hearing before the Subcommittee on Commercial and Administrative Law of the Committee on the Judiciary, House of Representatives, One Hundred Eleventh Congress, second session, July 27, 2010. Cyber security, 2009 : hearings before the Committee on Homeland Security and Governmental Affairs, United States Senate of the One Hundred Eleventh Congress, first session. U.S. G.P.O., 2010. Racial profiling and the use of suspect classifications in law enforcement policy : hearing before the Subcommittee on the Constitution, Civil Rights, and Civil Liberties of the Committee on the Judiciary, House of Representatives, One Hundred Eleventh Congress, second session, June 17, 2010. Comprehensive Alcohol Regulatory Effectiveness (CARE) Act of 2010 : hearing before the Committee on the Judiciary, House of Representatives, One Hundred Eleventh Congress, second session, on H.R. 5034, September 29, 2010. Medicare Advantage : hearing before the Subcommittee on Health of the Committee on Ways and Means, U.S. House of Representatives, One Hundred Tenth Congress, second session, February 28, 2008. The economic and societal costs of poverty : hearing before the Committee on Ways and Means, U.S. House of Representatives, One Hundred Tenth Congress, first session, January 24, 2007. The state of U.S. coins and currency : hearing before the Subcommittee on Domestic Monetary Policy and Technology of the Committee on Financial Services, U.S. House of Representatives, One Hundred Eleventh Congress, second session, July 20, 2010. The future of the U.S. Postal Service : hearing before the Federal Financial Management, Government Information, Federal Services, and International Security Subcommittee of the Committee on Homeland Security and Governmental Affairs, United States Senate of the One Hundred Eleventh Congress, second session, April 22, 2010. Valles Caldera : hearing before the Committee on Energy and Natural Resources, United States Senate, One Hundred Eleventh Congress, second session, to receive testimony on S. 3452, a bill to designate the Valles Caldera National Preserve as a unit of the National Park System, and for other purposes, June 30, 2010. Public lands and forests legislation : hearing before the Subcommittee on Public Lands and Forests of the Committee on Energy and Natural Resources, United States Senate, One Hundred Eleventh Congress, second session, to [i.e. on] S. 3294, S. 3310, S. 3313, June 16, 2010. Financial derivatives on energy markets : hearing before the Committee on Energy and Natural Resources, United States Senate, One Hundred Eleventh Congress, second session, to examine financial transmission rights and other electricity market mechanisms, March 9, 2010. Agent Orange in Vietnam : recent developments in remediation : hearing before the Subcommittee on Asia, the Pacific, and the Global Environment of the Committee on Foreign Affairs, House of Representatives, One Hundred Eleventh Congress, second session, July 15, 2010. Customs reauthorization : strengthening U.S. economic interests and security : hearing before the Committee on Finance, United States Senate, One Hundred Tenth Congress, second session, March 13, 2008. Aviation safety : the relationship between network airlines and regional airlines : hearing before the Subcommittee on Aviation Operations, Safety, and Security of the Committee on Commerce, Science, and Transportation, United States Senate, One Hundred Eleventh Congress, first session, August 6, 2009. Recent developments in U.S. financial markets and regulatory responses to them : hearing before the Committee on Banking, Housing, and Urban Affairs, United States Senate, One Hundred Tenth Congress, second session, on recent developments in U.S. financial markets and regulatory responses to them, Tuesday, July 15, 2008. Online privacy, social networking, and crime victimization : hearing before the Subcommittee on Crime, Terrorism, and Homeland Security of the Committee on the Judiciary, House of Representatives, One Hundred Eleventh Congress, second session, July 28, 2010. Current water bills : hearing before the Subcommittee on Water and Power of the Committee on Energy and Natural Resources, United States Senate, One Hundred Eleventh Congress, second session, on S. 2891, S. 2779, S. 3387, S. 3404, H.R. 3671, H.R. 4252, June 9, 2010. Census 2010 : hard-to-count populations with special living conditions : hearing before the Subcommittee on Information Policy, Census, and National Archives of the Committee on Oversight and Government Reform, House of Representatives, One Hundred Eleventh Congress, first session, March 8, 2010. Electric vehicles : hearing before the Committee on Energy and Natural Resources, United States Senate, One Hundred Eleventh Congress, second session, to receive testimony on policies to reduce oil consumption through the promotion of accelerated deployment of electric-drive vehicles, as proposed in S. 3495, the Promoting Electric Vehicles Act of 2010, June 22, 2010. The Federal Protective Service : time for reform : hearing before the Committee on Homeland Security and Governmental Affairs, United States Senate of One Hundred Eleventh Congress, first session, July 8, 2009. Invasive species : hearing before the Subcommittee on Water and Power of the Committee on Energy and Natural Resources, United States Senate, One Hundred Eleventh Congress, second session, to examine the federal response to the discovery of the aquatic invasive species Asian carp in Lake Calumet, Illinois, July 14, 2010. Prospects for democracy in Hong Kong : assessing China's international commitments : roundtable before the Congressional-Executive Commission on China, One Hundred Eleventh Congress, second session, July 14, 2010.
Review of the United States' climate policy, the $5 billion budget request for climate-related science and technology in fiscal year 2006 : hearing before the Subcommittee on Global Climate Change and Impacts of the Committee on Commerce, Science, and Transportation, United States Senate, One Hundred Ninth Congress, first session, July 20, 2005. Blue, gold, and green : how Delaware state and local governments are cutting their energy costs : hearing before the Federal Financial Management, Government Information, Federal Services, and International Security Subcommittee of the Committee on Homeland Security and Governmental Affairs, United States Senate, of the One Hundred Eleventh Congress, second session, field hearing in Wilmington, Delaware, February 19, 2010. Empowering consumers : can financial literacy education prevent another financial crisis? : field hearing before the Subcommittee on Oversight and Investigations of the Committee on Financial Services, U.S. House of Representatives, One Hundred Eleventh Congress, second session, August 24, 2010. Social Security disability backlogs : hearing before the Subcommittee on Social Security of the Committee on Ways and Means, U.S. House of Representatives, One Hundred Tenth Congress, first session, February 14, 2007. Principles of U.S. engagement in Asia : hearing before the Subcommittee on East Asian and Pacific Affairs of the Committee on Foreign Relations, United States Senate, One Hundred Eleventh Congress, second session, January 21, 2010. Implications of the Volcker Rules for financial stability : hearing before the Committee on Banking, Housing, and Urban Affairs, United States Senate, One Hundred Eleventh Congress, second session, on examining the implications of the Volcker Rules for financial stability, February 4, 2010. Cambodia's small debt : when will the U.S. forgive? : hearing before the Subcommittee on Asia, the Pacific, and the Global Environment of the Committee on Foreign Affairs, House of Representatives, One Hundred Eleventh Congress, second session, September 30, 2010. The future of housing finance : the role of private mortgage insurance : hearing before the Subcommittee on Capital Markets, Insurance, and Government Sponsored Enterprises of the Committee on Financial Services, U.S. House of Representatives, One Hundred Eleventh Congress, second session, July 29, 2010. Hearing on H.R. 1229 : the Nonmarket Economy Trade Remedy Act of 2007 : hearing before the Subcommittee on Trade of the Committee on Ways and Means, U.S. House of Representatives, U.S. House of Representatives, One Hundred Tenth Congress, first session, March 15, 2007. Census 2010 : assessing the Bureau's strategy for reducing the undercount of hard-to-count populations : hearing before the Subcommittee on Information Policy, Census, and National Archives of the Committee on Oversight and Government Reform, House of Representatives, One Hundred Eleventh Congress, first session, March 23, 2009. Haiti : from rescue to recovery and reconstruction : hearing before the Committee on Foreign Relations, United States Senate, One Hundred Eleventh Congress, second session, January 28, 2010. Sudan : a critical moment for the C.P.A., Darfur, and the region : hearing before the Committee on Foreign Relations, United States Senate, One Hundred Eleventh Congress, second session, May 12, 2010. Removing the shroud of secrecy. Pts. I and II : making government more transparent and accountable : hearings before the Federal Financial Management, Government Information, Federal Services, and International Security Subcommittee of the Committee on Homeland Security and Governmental Affairs, United States Senate of the One Hundred Eleventh Congress, second session, March 23 and April 13, 2010.